The innovation is intended to attract more spectators. Abbas believes day-night Tests can give the public, whether working people or school children, the chance to watch or listen to the game at a time that suits them. The president of the International Cricket Council hopes day-night cricket Test matches will attract more spectators. Zaheer Abbas, the president of the International Cricket Council, hailed the concept of day-night Test matches days before Australia play New Zealand in the first-ever such match, adding thathe saw the idea as “thoroughly enlightened”. “The sceptics and critics might call it a leap in the dark but I prefer to view the decision to play day-night Test cricket – a concept set to become reality when Australia plays New Zealand in Adelaide – as thoroughly enlightened,” Abbas wrote in his column for the ICC website on Sunday (November 22). The innovation is intended to attract more spectators. Abbas, himself a former Pakistani batting great, said he had a good experience of day-night matches when he played for Kerry Packer, the Australian tycoon, in the 1970s.”I speak from experience, as one of a group who you could call floodlit cricket pioneers. I was one of the players signed up by Kerry Packer to be part of World Series Cricket in 1977 and it was through my involvement that I was exposed to day-night matches for the first time,” wrote Abbas. Abbas said it “seems remarkable that it has taken 38 years for our great sport to move from that point to one where we are now looking forward to our first Test under lights. Abbas said players must be thankful to Packer’s one-day innovations, with players in coloured clothing competing under floodlights. The fact that the Adelaide Test starting on Friday will be the series-decider (after Australia won the first Test in Brisbane while the second at Perth was drawn) will add to its attraction. Norman Vanua’s four-wicket haul helped Papua New Guinea bowl Afghanistan out for 144 in 39.4 overs on the first day of the two sides’ Intercontinental Cup match at the Sharjah Cricket Stadium on Saturday (November 21). At stumps, PNG had reached 205 for 6, taking its lead to 61 runs, with Mahuru Dai unbeaten on 67 and John Reva yet to open his account. Having chosen to bat first, Afghanistan lost Shabir Noori in the first ball of the fourth over when he went on the backfoot to a good length delivery from Chad Soper and was hit on his pads. Not long after that Soper picked up his second wicket when Noor Ali Zadran, the other opener, cut a short delivery into the hands of Tony Ura at point. Vanua was introduced into the attack in 17th over and he struck with his first ball when Mohammad Shahzad was trapped in front for 29, the highest score in the innings. Afghanistan could not build partnerships as wickets fell at regular intervals. Vanua picked up his second wicket in his fourth over when Asghar Stanikzai could not execute a cut shot properly and edged the ball to Assad Vala at point. Vanua also accounted for Samiullah Shenwari and Sharafuddin Ashraf to finish with figures of 7-2-36-4. That Afghanistan managed to get close to 150 was because of Ashraf’s 24-ball 25, which included three fours and the only six of the innings. PNG lost three wickets early in its innings, as Yamin Ahmadzai bowled Ura and trapped Lega Siaka lbw off consecutive deliveries in the seventh over, and then had Vani Morea caught at mid-off in the ninth over. With the scorecard reading 41 for 3, Vala and Sese Bau resurrected the innings with a 55-run stand in 12.1 overs. Bau could not capitalise on his start as Shenwari had him lbw for 34. PNG, however, had a solid platform by then, and Vala and Dai strengthened it further with a 105-run association in 25 overs. During the partnership, the pair hit eight fours and three sixes, and focussed on rotating the strike. Zahir Khan had Vala stumped for a 110-ball 62 in the last ball of the 46th over. An over later, Jack Vare, PNG’s captain, became the sixth batsman to be lbw in the day. But Dai and Reva denied Afghanistan any more inroads. Afghanistan had drawn its first game against Scotland, while PNG had beaten Netherlands by five wickets. PNG currently sits at the fifth spot on the eight-team points table, while Afghanistan is seventh. For the last several years, Kane Williamson has been touted as the Next Big Thing in New Zealand cricket, even world cricket. Those who have watched him bat from his early days have spoken of his technical excellence, his ability to bat long periods, his even temperament, and his ability to handle pressure – all attributes that are key ingredients towards the makings of a great batsman. A century on Test debut in India seemed to further confirm that Williamson was already the finished product even though he was only a 20-year-old at the time. Over the next three years Williamson showed enough glimpses of his class, but in between there were also disappointing passages when potential didn’t convert into runs. By the end of 2013, after three years in international cricket, Williamson had a Test average of 35.88 (from 29 matches), and an ODI average of 35.41 (from 47 games). While a mid-30s average wasn’t so bad for a player who was in the early stages of his career, clearly it wasn’t commensurate with the expectations he had generated, especially as a Test batsman. Fast forward to the end of 2015, and all of that has changed. Williamson has scored so many runs over the last two years that he has established himself as one of the best going around today. And he has done it with the technical expertise and grace that is easy on the eye: on the aesthetics scale he is clearly above some of the other young batsmen who have also been prolific recently. The ICC rankings list him at No. 2 in Tests (after AB de Villiers) and No. 3 in ODIs (after de Villiers and Virat Kohli), and not many will dispute those numbers. Since the beginning of 2014, Williamson averages 78.34 in Tests, the highest among batsmen who have scored at least 1000 runs during this period; in ODIs, he averages 61.38, next only to de Villiers and Ross Taylor, with the same runs cut-off. In all international matches he has 4267 runs, the highest among all batsmen in these two years. In Tests during this period, he has scored hundreds eight out of 12 times when he has passed 50, including a double-century and three other 150-plus scores; in ODIs he has 19 fifty-plus scores in 37 innings. Unlike some of the other teams, New Zealand haven’t always had an abundance of batting riches in Tests. No batsman has scored more than 7200 Test runs, and among those who have topped 2000, the best average – apart from Williamson’s 49.26 – is Ross Taylor’s current average of 46.98. Martin Crowe finished with 45.36, while only five others have 40-plus averages. 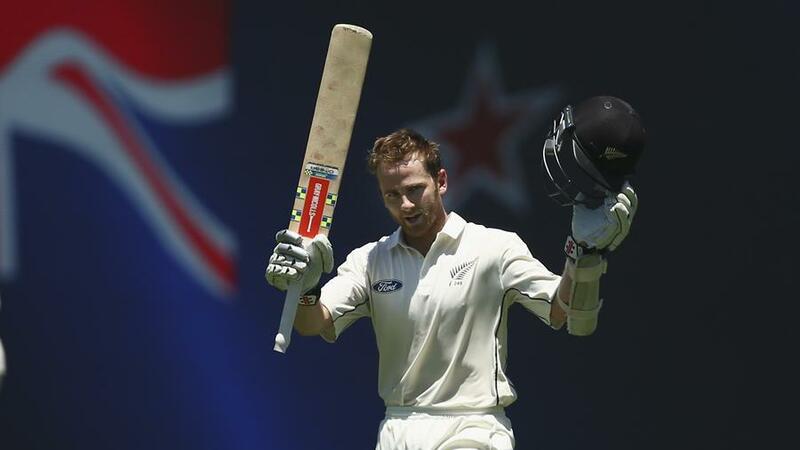 If Williamson does lift his average to 50 – given his current form that looks a formality – it will be the most matches after which a New Zealand batsman has had a 50-plus average. In their entire Test history, only two batsmen have had a 50-plus average at any point in their career after playing 25 or more Tests – Glenn Turner and Andrew Jones. (These are averages at the end of a Test match, not after one innings.) Turner finished with a career average of 44.64, but after 32 Tests he averaged 50.42, after 31 he averaged 50.14, and he also had 50-plus averages after his 29th, 27th and 26th Tests. In his last 17 innings, though, he averaged only 27.64, which is why his career average fell so sharply at the end. Similarly, Jones finished with a career average of 44.27, but after 25 he averaged 53.10, and 26 the average was 51.70. In his last 13 Tests, though, his average dropped to 32.08. Mark Richardson was the other New Zealand batsman who played 25-plus Tests and came close to an average of 50: after 26 matches he averaged 49.36, but thereafter his numbers fell steadily; the last time he averaged more than 50 was after 16 Tests (51.25). The New Zealand batsman that Williamson is compared with most often, though, is Martin Crowe, arguably New Zealand’s best in terms of technique, talent and style. When at his best, Crowe combined those attributes with an insatiable appetite for runs: between 1985 and 1991, which were his best years, no batsman averaged more than his 58.46; the next-best was Andrew Jones, with 54.93 (with a 500-run cut-off). Crowe, though, had a poor start to his Test career, averaging only 24.08 after 16 Tests; that ensured his career average never touched 50 at any point; it peaked at 48.41, after 61 matches, and finished at 45.36 after 77. The other aspect of Williamson’s career that has stood out so far is his consistency against different opponents. He has already scored Test hundreds against eight different opposition teams, despite having scored just 12 Test centuries so far. Only four other batsmen – Marvan Atapattu, Herschelle Gibbs, Adam Gilchrist and Ashwell Prince – have scored centuries against eight different teams in their first 12 Test centuries. The only opposition missing in Williamson’s case is Zimbabwe, against whom his highest in three innings is 68. The two countries where he doesn’t have a Test hundred yet are South Africa and Zimbabwe: he struggled in South Africa in 2013, scoring 43 runs in four innings. He didn’t enjoy Australia much either on his first tour there in 2011, scoring 72 in four innings, but on the current tour he has scored more than five times as many runs. He will be looking to do something similar the next time New Zealand tour South Africa. Williamson also has Test centuries in each of the four Asian countries he has played in – India, Sri Lanka, Bangladesh and the UAE. In England he averages 30.87, but those numbers include a century, though an aggregate of 115 from the remaining seven innings don’t make impressive reading. The best is clearly yet to come, but already Williamson’s records in Tests and in ODIs are the best among New Zealand batsmen. By the time he is done, his stats should compare favourably with the best in the world.